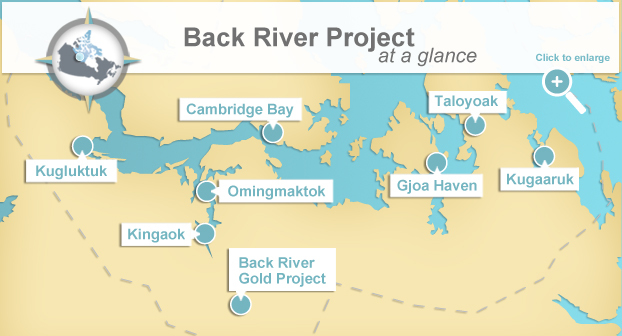 The Back River Project is a planned gold mine in the western Kitikmeot Region of Nunavut. Inuinnaqtun and English are spoken in this community. The English name for Kugluktuk, which means “place of moving waters” in Inuinnaqtun, is Coppermine. This is the second largest community in the region with a population of 1,400 (as of 2011). Residents take part in a variety of traditional activities including trapping, hunting, fishing as well as arts and crafts. There are a number of businesses related to contracting and equipment, retail, tourism, accommodation and food services. 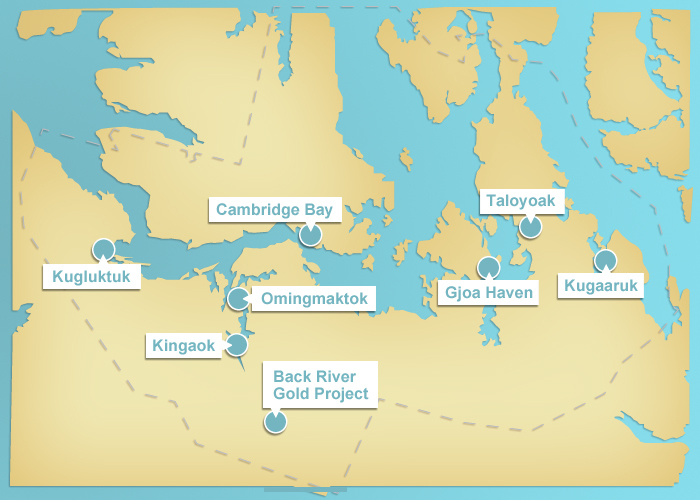 Kugluktuk is approximately 460 km from the Goose Property and 395 km from the George Property. Inuinnaqtun and English are spoken in this community. The English name for Ikaluktutiak, which means “good fishing place” in Inuinnaqtun, is Cambridge Bay. With more than 1,600 people, Ikaluktutiak is the largest community in the region. This community acts as a regional hub (for business, transportation and government) and a traditional site for hunting and fishing. Residents continue to harvest local foods such as caribou and Arctic char. There are also a number of businesses in the area. Ikaluktutiak is approximately 400 km from the Goose Property and 370 km from the George Property. Inuktitut and English are spoken in this community. 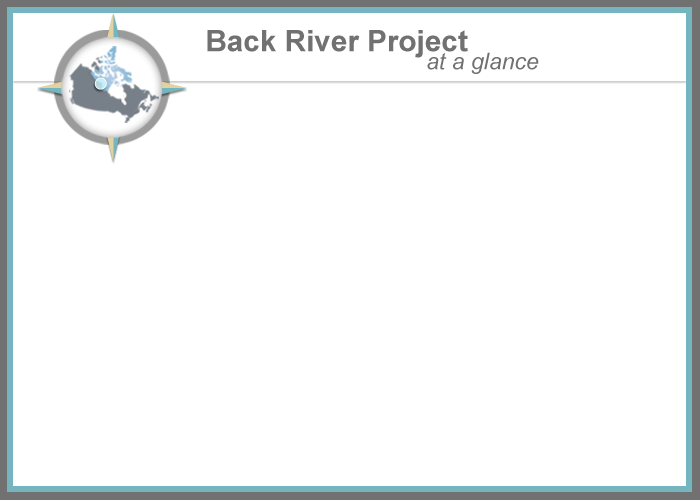 The English name for Taloyoak, which means “caribou blind” in Inuktitut, is Spence Bay. The population in 2011 in Taloyoak was close to 900 people. The main forms of economic activity in Taloyoak are hunting, trapping, crafts, carving and fishing. Local businesses include construction, contracting, retail, technical and communication services, accommodation and food services. This community is approximately 700 km from the Goose Property and 705 km from the George Property. Inuktitut and English are spoken in this community. The English name for Kugaaruk, which means “little stream” in Inuktitut, is Pelly Bay. Kugaaruk is one of the youngest and fastest growing communities in the Kitikmeot Region. This is also one of the most traditional communities in the region. There is a high level of participation in traditional activities in the community including hunting, trapping and fishing. Local businesses offer services such as construction, contracting, technical and communication services, tourism, accommodation and food services. Kugaaruk is approximately 790 km from the Goose Property and 805 km from the George Property. Inuktitut and English are spoken in this community. Ursuqtuq, or Gjoa Haven, means “place of plenty of blubber” in Inuktitut. As of 2011, there were 1,280 people living in this community. Hunting and fishing are important traditional economic activities in Ursuqtuq as is harvesting. There are a number of businesses operating in the community such as construction, contracting, retail, technical and communication services, accommodation and food services. Ursuqtuq is approximately 570 km from the Goose Property and 575 from the George Property. Inuinnaqtun and English are spoken in this community. The English name for Omingmaktok, which means “like a muskox” in Inuinnaqtun, is Bay Chimo. This is primarily a seasonal hunting and fishing camp. The closest community services (retail, education, policing and medical) are found in Ikaluktutiak (Cambridge Bay). Omingmaktok is approximately 250 km from the Goose Property and 200 km from the George Property. Inuinnaqtun and English are spoken in this community. The English name for Kingaok, which means “nose mountain” in Inuinnaqtun, is Bathurst Inlet. This is a seasonal community. Most of the population lives in Ikaluktutiak (Cambridge Bay) in the winter. With the exception of the Bathurst Inlet Lodge (a joint ecotourism venture between Bathurst Arctic Services and Bathurst Inlet Inuit), there is no retail, education, medical, police or other community services. Kingaok is approximately 160 km from the Goose Property and 100 km from the George Property. The project is currently in the advanced exploration and permitting stage. Operations are expected to begin in 2016-2017. Unlocking precious metals opportunities in the Canadian North.